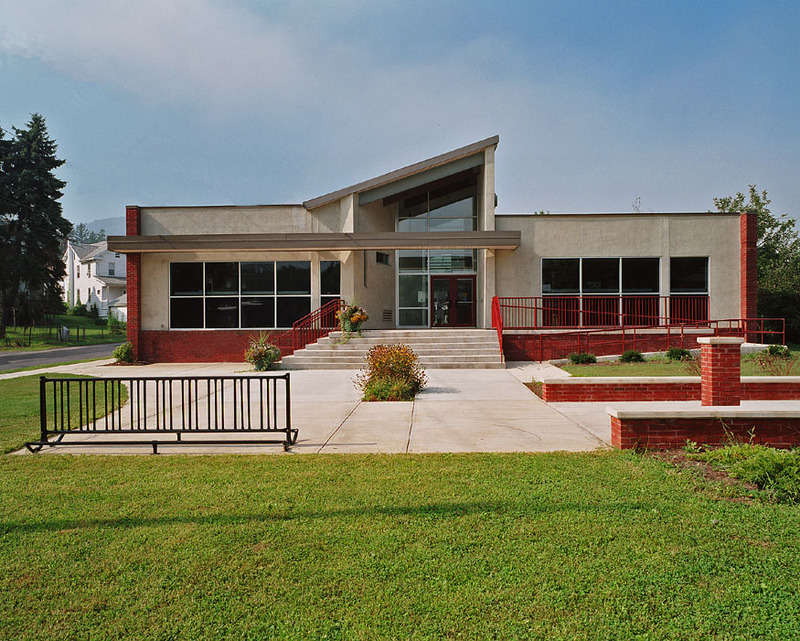 This was the first in a series of prototype branch libraries that were built for the Dauphin County Library System. We began with a prototype design that showed ways we could standardize features by using a linear scheme with a service core. 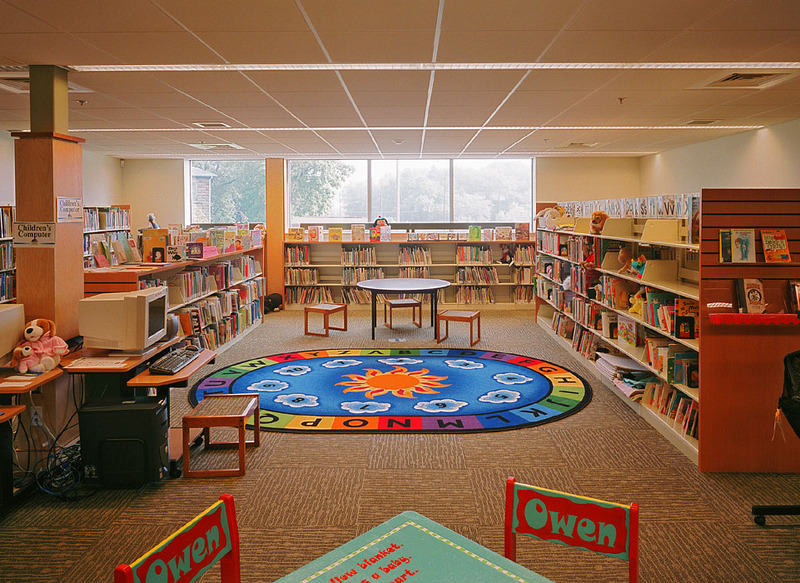 This would control costs and provide a consistent plan to separate library services into general book stacks, a reading area, a children’s section, and computer workstations. Standard features also include maximizing the use of natural light, using the main circulation desk to separate the office and processing areas from the main book stacks and reading areas, and provide a community room and staff break room that would share a common kitchen area. Large glass areas on the front of the building fill the interior with natural light. 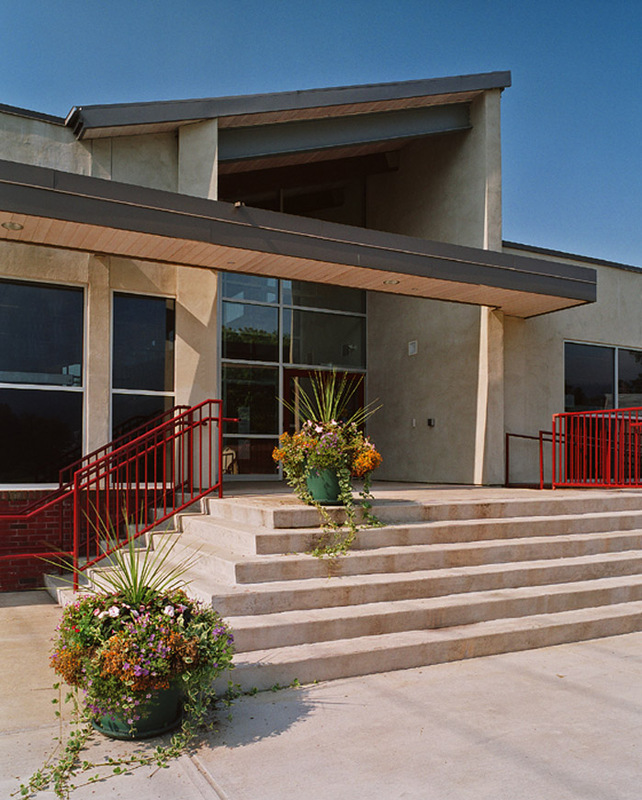 The large patio area is furnished in warm months to provide a delightful outdoor reading area with an adjacent space for summer children’s programs. The façade is a beautiful combination of earthy tones highlighted by the elevated second story stucco surface that surrounds the large angled glass windows. When inside you can see how the angled glass windows let an abundance of light pour into the room where the pitched ceiling mirrors the exterior design. 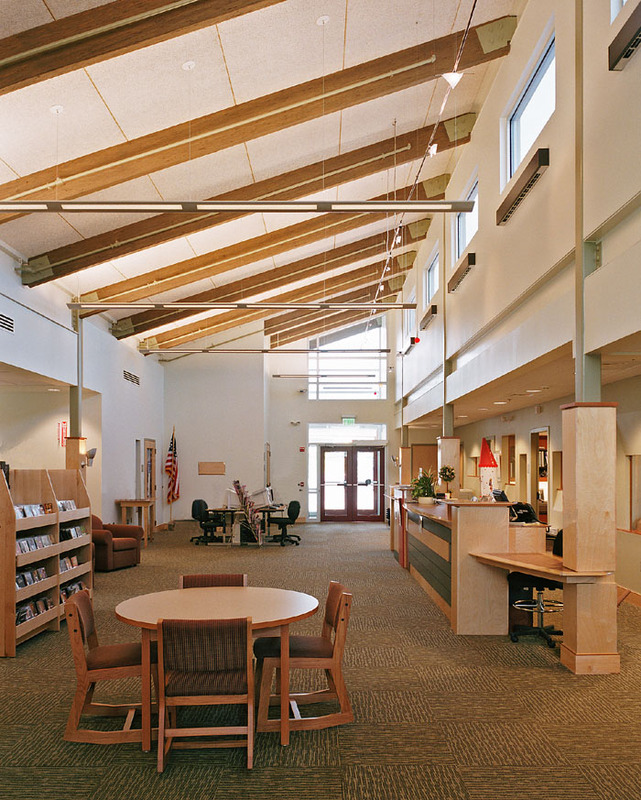 The sloping roof system is used to organize the floor plan, separating staff and work areas from the reading and technology side of the building. Modular designs are used in the circulation desk and cabinets that can readily be adapted to other branch facilities. Earth tones from the façade are repeated in the textured carpeting and warm wood tones. 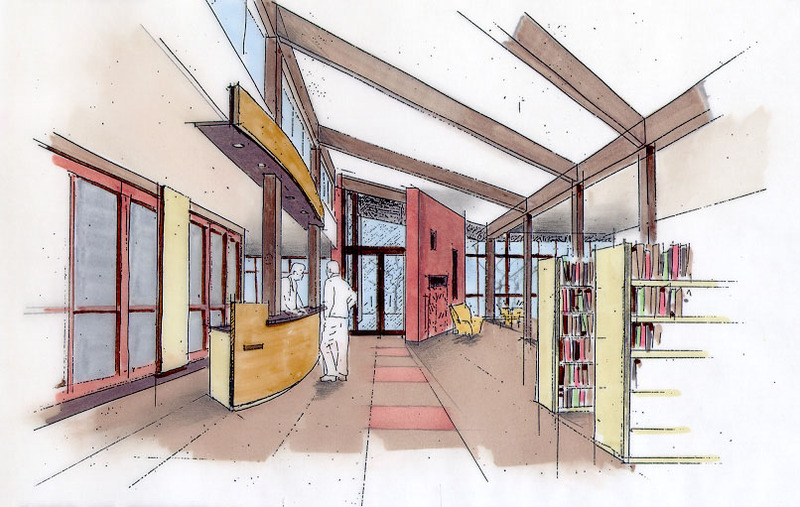 This rendering shows many of the common features of the branch library prototype including the sloped roofline, expansive use of windows, separation of the main desk from the book stacks and reading area, and use of natural earth tones in the color schemes. The renovated and expanded children’s area is now a colorful and cheerful place where kids can read, explore, and discover information. Shelving and furniture are all height appropriate. Ceilings are low with warm ambient light that complements the natural light from the large windows and allows a connection with the outdoors. The color schemes and furnishings clearly define this space from other areas of the library. 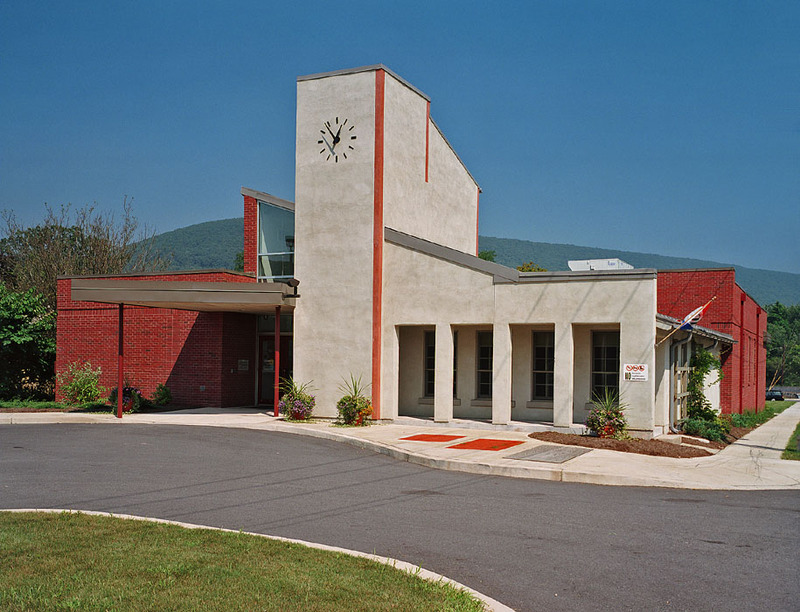 The exterior view of the main drop off area and entrance shows how the mix of brick and stucco are combined to reinforce the same branding and style even though different sides of the building have variations in the way the elements are used. From this angle the sloping roof mirrors the downward slop of the mountains behind the building. The front door is recessed under a generous colonnade that provides weather protection for patrons as it connects to the sidewalk.